It may not have been as big as the one that got away but you can now map the fish that you actually caught. With Whoppa you can keep a detailed record of all your fly fishing catches and favourite fly fishing spots. Whoppa basically consist of two main sections 'Fish' and 'Spots'. 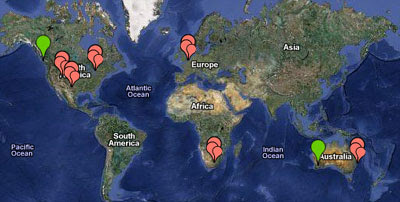 Using the 'Spots' part of the site you can search a Google Map for fly fishing spots around the world. You can find out what flies are working, where they are working, at what time of year and even in what weather conditions. The 'Fish' section of the website lets you add your recent catches to a Google Map and browse the catches of other Whoppa members. You can show the location of your catch and submit details on the weight of your catch, the date, fly used and the weather conditions. East Coast Fishing and Surfing - US east coast surfing and fishing locations.